Waubaushene is a town of about 950 permanent and seasonal residents on the shore of Georgian Bay. It is located just off the 400, on Highway 12, about 20 km east of Midland. The town includes a library, several marinas, excellent sports facilities, and access to the Tay Shore Trail. A map of Waubaushene can be found here. To view posts that have been written about Waubaushene, click “Waubaushene” in the “Tags” portion of the right hand sidebar. Waubaushene is a charming community of several hundred full-time and cottage residents in Tay Township on the south eastern shore of Georgian Bay. “Waubaushene” is a First Nations word, possibly meaning “land of the rocky marsh”. The town’s location at the outlets of the Severn River and Matchedash Bay has been the key factor in its history. These two major water routes joining Lake Ontario to Georgian Bay and the northwest were instrumental for exploration and trade. Later, the area became a major collection point for lumber shipments to southern and overseas markets. In town you will find clapboard *salt box” cottages, rambling frame houses, stately brick homes and several present and former churches, many of which are remnants of Waubaushene’s lumber era (1861 – 1924). But the area’s early history stretches back many centuries before the onset of development and industry. Then, some 20-30,000 First Nation peoples, primarily the Wendat (Hurons), farmed and trapped the area to the west and south from their villages on local rivers. One example is the site, later named St Ignace II, on the Sturgeon River off nearby Rosemount Road. Trade with neighbouring villages and tribes followed well-established bay and river routes, as well as overland trails. In 1610 the first European in the area, Étienne Brulé, arrived from Quebec to explore the area and to develop fur trade relations with the Wendat. He was followed in 1615 by the governor of Quebec, Samuel de Champlain, who came to lead the Wendat in a raid against the Iroquois to the south of Lake Ontario. The year 1615 also saw the advent of Roman Catholic missionaries living in and visiting the native villages, culminating in the establishment of a headquarters at Sainte-Marie among the Hurons on the Wye River in 1639. War with the Iroquois led to the destruction of the Huron nation and the French mission in 1649. Ojibwa and other native peoples next moved into the area, followed by European fur traders establishing posts by the water. One, George Cowan, married an Ojibwa woman, and operated a trading post on the east side of Matchedash Bay from 1778 until his death in 1804. In 1798 the Ojibwa sold much of the land in present-day Tay and Tiny Townships to the government. Other famous explorers voyaging past included La Salle by the Severn River to the Mississippi in 1681 and 1683, Alexander Henry from the Northwest through Matchedash Bay in 1784, John Graves Simcoe by the Severn River to Cowan’s post in 1793, and Sir Sam Steele via Matchedash Bay to the Rockies in 1874. Many of the first roads in the area, the Coldwater Road for example, followed Indian trails. After the war of 1812, more roads and free land grants to militia and Loyalists helped to spur settlement. After 1832, steamer service on Lake Simcoe and Georgian Bay helped bring in more settlers and freight. In 1844 the Sturgeon Bay Road was opened between Coldwater and Tay Port, at the mouth of the Sturgeon River, which for a time became the embarkation point for passengers travelling to the upper lakes. About this time, several small lumber mills sprang up in the area, initially to serve mostly local markets. These included the Christie Mill at Port Severn, the Laramy mills at Sturgeon Bay, and the Hogg mill at Victoria Harbour. In 1861 William Hall of Hamilton built a sawmill at Waubaushene. Development of the surrounding 260 acre town site began as the company built housing and amenities for the mill – workers and managers. In the mid-19th century, several forces had combined to create a burgeoning lumber industry. White pine was in plentiful supply along the shores and rivers emptying into Georgian Bay and the north shore of Lake Huron. Canadian sawn lumber could enter the US duty-free to meet the huge demand there in new towns and cities. Square timber was in great demand for British military and commercial shipping. Water-powered, then steam-powered saws greatly increased mill productivity. 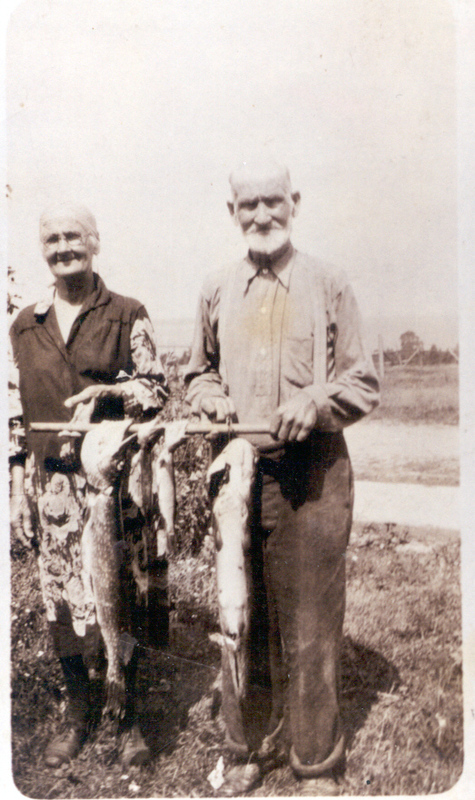 Commercial fishing became well-established in the area. 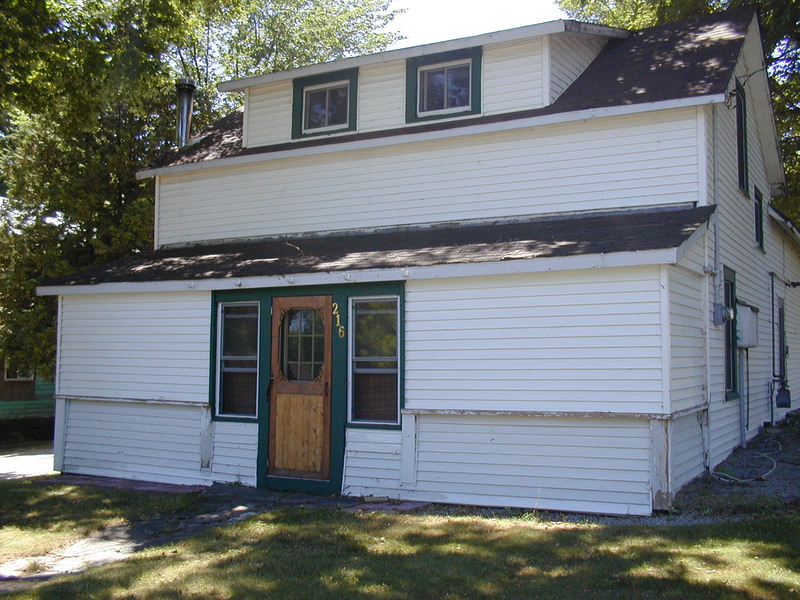 Commercial fish houses were built at Waubaushene and Victoria Harbour. Sturgeon, pickerel and whitefish were netted in local waters, the sturgeon shipped as far as New York City. 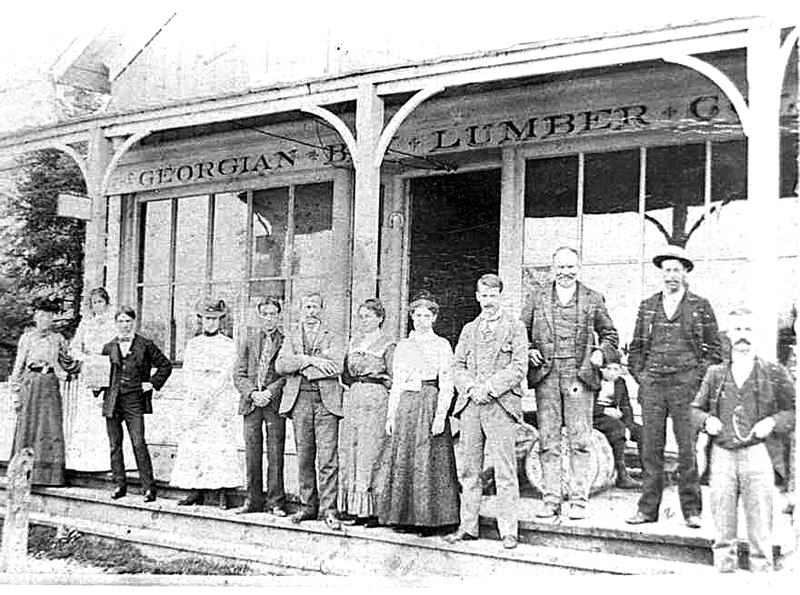 In the years 1869-1872, Anson G. Phelps Dodge, an American entrepreneur, arrived to buy and expand the Hall and eight other lumber mills around Georgian Bay. Hundreds of square miles of timber rights, bush camps, schooners, tugboats, warehouses, and yard engines added to the investment. Log booms were towed to the mills, ultimately from as far away as Blind River on the north shore. Sawn lumber was loaded on to barges, schooners, and steamboats for shipment to ports in Canada and the US. After the Midland Railway from Orillia reached Waubaushene in 1875, rail transport to the south became available. The Dodge mills were incorporated in three companies, including the Georgian Bay Lumber Company, with the headquarters, senior management and the largest of the mills at Waubaushene. 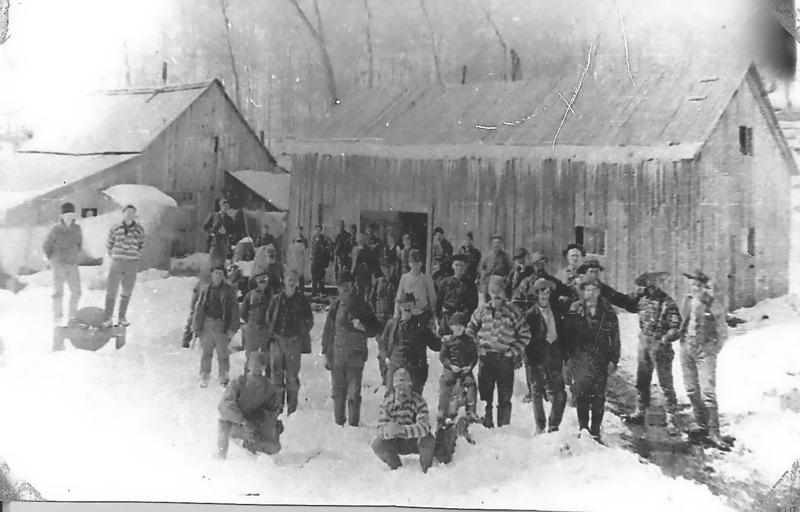 This mill alone employed about 250 men besides hundreds in the lumber camps and on drive. Dodge brought in key managers from his Pennsylvania lumbering companies to run the Waubaushene-based operations. The consolidated company was the largest of its time in terms of annual production and geographic span. It owned all the mills on Georgian Bay except the Victoria Harbour Lumber Company mills. Development at the town site had begun with the establishment of the Hall mill, but now was accelerated by the building of more free housing for married mill – workers, boarding houses for singles, two Company stores, 2 churches, a hotel, a library, 2 schools, a blacksmith shop, a livery stable, and several independent retailers. Workers flowed in from Ontario, Quebec and the US. In its heyday, the town numbered over 2,000 people. 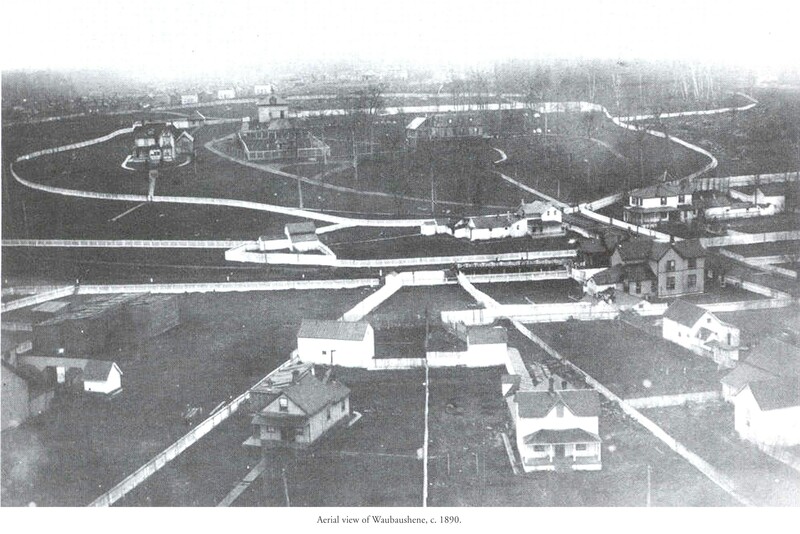 Waubaushene became a model “mill village,” similar to Victoria Harbour and other mill villages in Ontario and the US. The company provided whitewash for the yearly painting of houses and picket fences, thus the nickname “White Town”. When the Waubaushene mill burned in 1880, a new mill was built, powered by steam and lit by electricity, with a capacity of 300,000 board-feet per day. When the Port Severn mill burned in 1896, it was replaced by a second mill in Waubaushene. By 1920 however, most of the commercial pine below Sault Ste. Marie had been harvested and the company ceased operations in 1924. By 1925 the mill was torn down and most of the company property was sold. Several hundred workers were laid off and the town lost its economic base. Those families who stayed in the area found opportunities with local boat builders, steamship companies, tourist operations, home builders, Hydro Electric and the railways. Some reminders of the lumber era in Waubaushene remain. At 22 Hazel Street stands Christ Church (1881), donated by William Dodge in memory of TW Buck, general manager of the Company. 46 Hazel Street (1883) is now a private residence, but has over time served as a Catholic Church, a school, and an International Order of Odd-Fellows Hall. 53 Elm Street (1923) is the former residence of a Company executive and director. 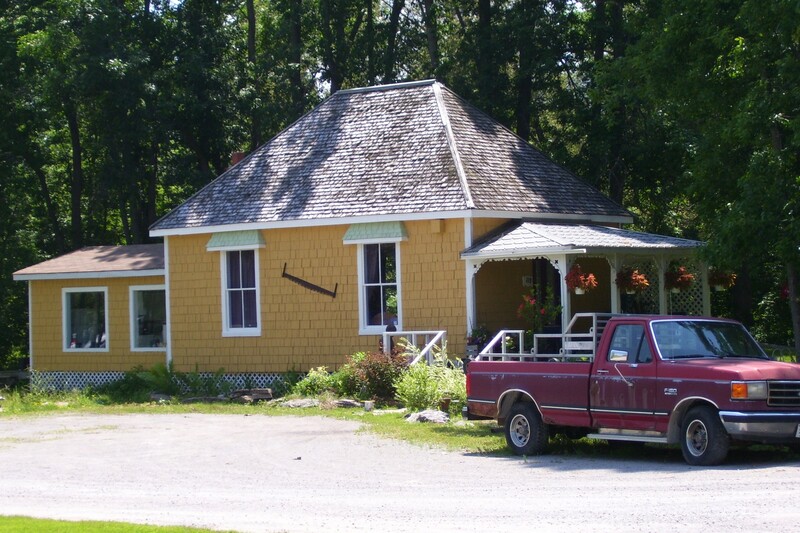 The building at 115 Coldwater Road (1878) is the former Company – built village library. Other Company –built structures include 6 former mill-worker houses between 46 and 135 Coldwater Road, eight houses between 200 and 316 Cherry Street, and 6 houses between 214 and 325 Palmer Street. St John’s Roman Catholic Church at 207 Pine Street (1916) harkens back to the times when Waubaushene was the headquarters of the Jesuit mission to Huronia. Today this historic area is complemented by the recreational Tay Trail on the former CNR right-of-way, several marinas on the waterfront, conservation areas to the west and south of the town, and numerous cottages and 2nd homes along the shoreline of Sturgeon Bay to the west. Click on an image to view more information about that property. Click for more information on 216 Cherry St.
Click for more information on 316 Cherry St.
Click for more information on 33 Coldwater Rd. 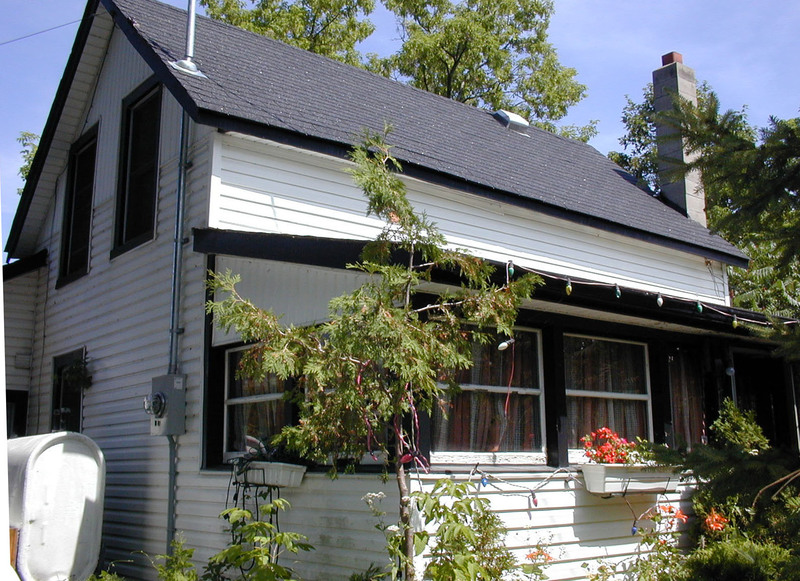 Click for more information on 90 Coldwater Rd. Click for more information on 115 Coldwater Rd. 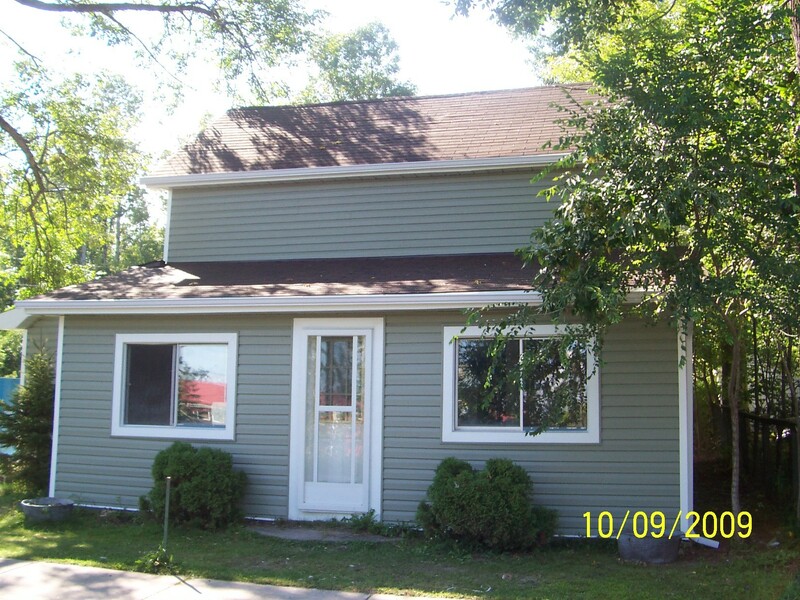 Click for more information on 22 Hazel St.
Click for more inoformation on 313 Ouida St.
who closes cottage in Town? Family surname spelt incorrectly. Under Historical information: George NIMMONS is not correct..
His name was George NIMENS. The name can be found in the Waubaushene Cemetary. I am George Nimens granddaughter (Joan Carolynne) . My name is also on the NIMENS (Clinton Edward(Joseph) and wife Edna Heels tomestone. I am looking for any past information (or pictures) on 112 Dodge Drive. Who can help me? Thanks in advance! I ran across the following information. I think that you refer to the Queen’s Hotel on the outskirts of Waubaushene on the southwest corner of Pine Street and Sturgeon Bay Rd. There is material in the Waubaushene library to indicate that the Hotel was built prior to 1900 and had a drinking license. Mr. Campbell had it built just outside the village limits where William Dodge, the owner of the Georgian Bay Lumber Company (and the town!) had decreed that no liquor could be sold to or consumed by his employees. Reportedly “Pete ran an open house”. The original hotel burned in 1909. When reconstruction began, the Town Council of Coldwater petitioned the provincial government not to renew the license as the incidences of drunkedness in nearby Coldwater had all but ceased when the hotel had burned. I remember it in the 50’s as an abandoned brick building with a porch facing Pine Street. It has since been demolished. Although the hotel was over grown with vegetation at the front ( Pine St) there was someone that lived there for many years; car parked in the back with grass cut for access. I am looking for information on a hotel that apparently burned down in what is now known as Forest harbour. Specifically a point between Forest Harbour road and O’Hara Lane. In regard to 127 Coldwater Rd. 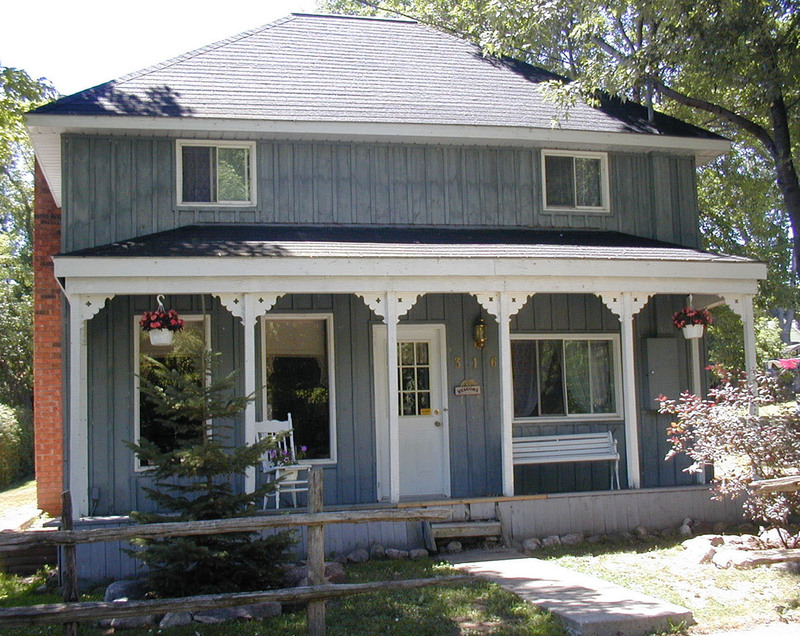 This house was owned by Ken and Shirley McDonald from 1967 until 1972. Regarding 127 Coldwater Rd. Waubaushene. The dates should be 1967 until 1992. In the mid 50s we rented on th south west corner of Quida St. and Albin Rd. I would have been 8 or 9 at the time. I was trying to remember who did the deliveries and as far as I can recall George Fallowfield was the milk man, but we also had ice delivered. That might have been Pete Brousseau from Coldwater Rd. but would like conformation if possible. This is great work and very interesting. Hello, I am looking for any information on my Grandfather and Great Grandfather from the 1800 hrs. His name was Abijah Jones Hopkins. Any information would be great.